CHESTERTOWN, MD—Novelist and short story writer Laura van den Berg, who is visiting Washington College as the 2012 Mary Wood Fellow, will read from her work at 5 p.m. Thursday evening, April 5. The reading will take place in Tawes Theatre, Gibson Center for the Arts, on campus (300 Washington Avenue). Sponsored by the Rose O’Neill Literary House and the Department of English, the event is free and open to the public. Earlier in the week, Tuesday, April 3, van den Berg will lead an informal chat on “Demystifying the Writing Life” at the Rose O’Neil Literary House, 407 Washington Avenue. 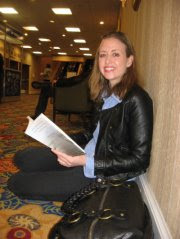 That event begins at 4:30 p.m.
Laura van den Berg’s work consists largely of short fiction. Her stories appear in such publications as Ploughshares, One Story, Best American Nonrequired Reading 2008, and Best New American Voices 2010. Her imaginative fiction often centers on female narrators and juxtaposes everyday life with the extraordinary. Van den Berg’s debut story collection, What the World Will Look Like When All the Water Leaves Us, received the 2007 Dzanc Prize and was published in October 2009 by Dzanc Books. A native of Florida, van den Berg received her MFA at Emerson College in Boston and has taught writing there, as well as at Gettysburg College and the Gilman School, where she served as the 2010-2011 Tickner Fellow. She lives in Baltimore, where she is teaching creative writing at Goucher College and working on several new stories and a novel. To learn more, visit her website at www.lauravandenberg.com. The Mary Wood Fellowship at Washington College is awarded biannually to an emerging female writer. The Fellowship, first extended in 2007, enables female creative writing students at Washington College to work with, and learn from, successful female writers like van den Berg, who spend several days on campus. Author Mary Wood, whose support makes the fellowship possible, is a ’68 graduate of the College and a former member of its Board of Visitors and Governors. This year, students Sarah Roy, Katie Manion, Erica Walburg, Jenna Moore, and Alison Schoenauer will be studying with van den Berg. The five students will read briefly from their own works at the beginning of the Thursday evening event.